This thesis aimed to establish novel prognostic tools that can be used for the risk stratification of adults with congenital heart disease and/or pulmonary hypertension. Measurements of right and left ventricular volumes and function, main pulmonary artery area, left atrial size and function, right ventricular pressure, pericardial effusion, and right atrial area are important imaging features that can be of prognostic value within specific diagnostic subgroups. Blood biomarkers can be measured in all patients; especially NT-proBNP should be measured at least once in all patients with moderate or complex ACHD. In patients with an elevated NT-proBNP level it is probably useful to obtain annual repeated NT-proBNP measurements and other biomarkers such as hs-TnT and RDW, while patients with a low NT-proBNP level can be reassured and may require less frequent follow-up. Finally, a simple risk calculation tool consisting of six easy to obtain clinical variables and NT-proBNP is proposed, which could be useful to discriminate high- and low-risk patients. 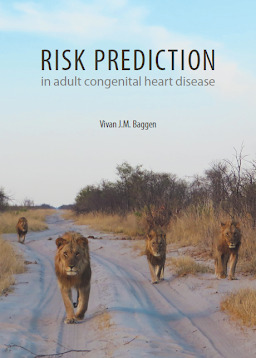 The novel biomarkers that are outlined in this thesis are a next step towards better risk stratification of patients with ACHD. This may serve to optimally inform and reassure patients, to aid clinical judgment in determining optimal monitoring and management strategies, to better utilize medical resources and save costs, and ultimately to improve the clinical outcome of these patients.